Beaten Champions League finalists Liverpool begin their quest to reach a third final in four years under manager Rafael Benitez on Tuesday. Liverpool's opening Group A game is away against Portuguese champions Porto in their Dragon Stadium. Since Jose Mourinho left the club to become manager of Chelsea, Porto have won two of the three league titles they have contested yet have proved less impressive on the European stage. BBC Sport gives the lowdown on Liverpool's opponents. Porto have won the Portuguese title 25 times, six times fewer than Benfica. Porto have twice been crowned Europeans champions, beating Bayern Munich in 1987 and most recently Monaco in 2004, when Mourinho was in charge. After Mourinho's departure for Chelsea and the loss of a number of key players, Porto proved unable to defend their 2004 title, with Benfica winning the championship in 2005. However after reclaiming the championship in 2006, Porto successfully defended their title last season, winning by a solitary point from Sporting Lisbon. Success in Europe has proved more elusive, with Porto only getting as far as the first knockout stage of the Champions League in both 2005 and 2007. The key to Porto's domestic success has been their ability to buy and sell players from South America, with Anderson, who was sold to Manchester United in the summer, the latest prospect to be moved on. "Porto aren't at the same level they were under Mourinho but the club have undergone many changes since he left," Portuguese journalist Alberto da Silva of A Bola newspaper told BBC Sport. "But Porto have changed Portuguese football. Benfica used to win everything but Porto are now the number one club." The star of the current Porto team is 23-year-old winger Ricardo Quaresma, who was linked with a move to Liverpool in the summer by the Portuguese press. Just before the recent transfer window closed, there were also reports that Chelsea wanted to sign the player. Quaresma began his career with Sporting Lisbon before joining Barcelona in 2003 for £4m. But Quaresma's career with the Catalan club never quite took off and, after he fell out with coach Frank Rijkaard, he joined Porto as part of the deal that took Deco to the Nou Camp. "Liverpool will have to be careful of Quaresma," said A Bola's da Silva. "He is at the level of Ronaldo." That may be, but Porto have lost several key players over the summer. As well as selling Anderson to United, Porto sold the Brazilian-born defender Pepe to Real Madrid for £20m. Manuel Jesualdo Ferreira, 61, has been a coach since he was 28, when he started working with Portugal's under-17 team. As well as working for the Portuguese Football Association, Ferreira has coached at Academica, Torreense, Estrela, Alverca, Benfica, Braga and Porto. Ferreira will have one thing in common with Liverpool manager Benitez - they are unlikely to be on Mourinho's Christmas card list. Ferreira and Mourinho first crossed paths in the 1980s, when the Chelsea coach was a student at the Lisbon Superior Institute for Physical Education and the current Porto coach was a teacher there. 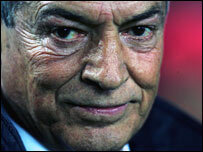 In 2002, when he was briefly Benfica coach, Mourinho refused to accept the appointment of Ferreira as his assistant. And in February 2005, Mourinho had a swipe at Ferreira in his weekly column for Portuguese magazine Record Dez. Comparing himself with Ferreira, Mourinho wrote: "One is a coach with a 30-year career, the other with a three-year one. "The one with 30 years has never won anything; the one with three years has won a lot. The one who has coached for 30 years has an enormous career; the one with three years has a small career. "The one with a 30-year career will be forgotten when he ends it; the one with three could end it right now and he could never be erased from history. "This could be the story of a donkey who worked for 30 years but never became a horse." However, journalist Da Silva is more charitable towards the man who has been Porto's coach for just over a year. "He is good technically," said Da Silva. "He is a good student of football and probably of men." Jorge Nuno Pinto da Costa has been president for 25 years but he may not be for very much longer - he is under judicial investigation for allegedly bribing referees. The allegations came to light following the publication of a book by Carolina Salgado, Da Costa's former girlfriend, in which she alleged the club had often paid bribes to referees. Da Costa has strongly denied the allegations. The Portuguese Football Federation is currently taking disciplinary action against 11 referees for having shown "signs of corruption in official matches". Da Silva stated: "The prospect of what is going to happen is very dark and the club will suffer. "There is kind of a moral crisis at the club. Porto want to forget it but they can't." Comment: Who will rule Europe?